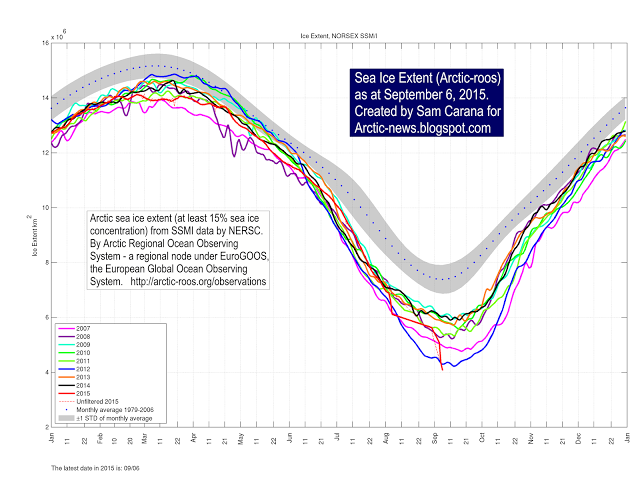 A graph of Arctic ice and sample years of extent. See the way the red line for 2015 drifts down? not good. I don’t have much to contribute here except to note that Robin Westenra, whose site I’m sending you to, has been doing the real leg-work on climate collapse and NTHE. I am merely here to offer you an introduction to his work. If you’re joining late, the question is how big this year’s Arctic Sea Ice loss is at the end of the summer season. Bloggers and scientists I’ve been quoting here have been talking about this year being a drop-dead date for Arctic ice–that the areas around the North Pole would be ice free come late September. Remember, the issue is that an Arctic without the Albedo effect will be warming the oceans that much more–and the ice that used to be at the top of the world is what has kept the thousands of gigatons of methane sequestered in the waters. And if you’ve been following me, you know that big releases of methane put us on the path to extinction pretty quickly. Methane releases of multiple gigatons are quite likely ‘at any time’ per scientist Natalia Shakova. Anyway, here’s Westenra’s blog, Seemorerocks, and his post on the ice. We’ll know soon if this is the end. In the meantime, Green Day calls it correctly. Wake me up when September ends–if we’re still here.